Around the 2nd century, the Romans began baking wheat and salt into small cakes to be served at a wedding feast. During the ceremony the groom would eat part of a loaf of this barley bread and then he would break the rest over his bride’s head. This was taken as a sign of good fortune and a blessing for long life, as well as many children. For more opulent weddings, it became traditional to pile many loaves in a great heap, high enough that the married couple had to stretch while trying to kiss over the top for all to see. Later, these piles were stuck together with an icing made from lard. Sugar was not always available. Sugar is not hard to find now – Nino’s uses Florida sugar, healthy non-bromated flours and other wholesome ingredients to make scrumptious cakes, fillings and icings. As the tradition of having a wedding cake rose, the extravagant creations baked for royalty became popular to imitate. And sugar was added to the icing. The whiter the icing, the more expensive the cake. Why white? Symbolism – White has always denoted purity. White icing was also a symbol of money and social importance in Victorian times. Wedding cakes take center stage in the traditional cake-cutting ceremony and symbolizes the first task that bride and groom perform jointly as husband and wife. The first piece of wedding cake is cut by the bride with the “help” of the groom. After the cake cutting, the couple feeds each other the first slice. This provides another lovely piece of symbolism, the mutual commitment of bride and groom to provide for one another. Especially if they resist the temptation to stuff the cake in each other’s mouths. Distributing pieces of wedding cake to one’s guests dates to the Roman Empire. Traditionally, the bride served the cake to the guests. But, as the number of wedding guests grew, so did the size of the wedding cake, and timely distribution became difficult. Some brides still serve their immediate families though. Modern wedding cakes are elaborate and typically three-tiered. The bottom tier is for eating at the ceremony. The middle tier is reserved for eating after the wedding event. A private family party perhaps? Many couples save the top layer to share on their first wedding anniversary. A tradition since the 1800’s, the cake tops then were saved for upcoming christening parties, sure to happen within the year. These cakes were often fruit cakes, which have a long shelf life. These days, a Christening cake is more likely to be its own elaborate and fresh-baked creation. Nino’s creates beautiful Christening cakes along with fun-themed children’s cakes, as well as beautifully decorative (and delicious) wedding cakes. If you can dream it – we can create it! 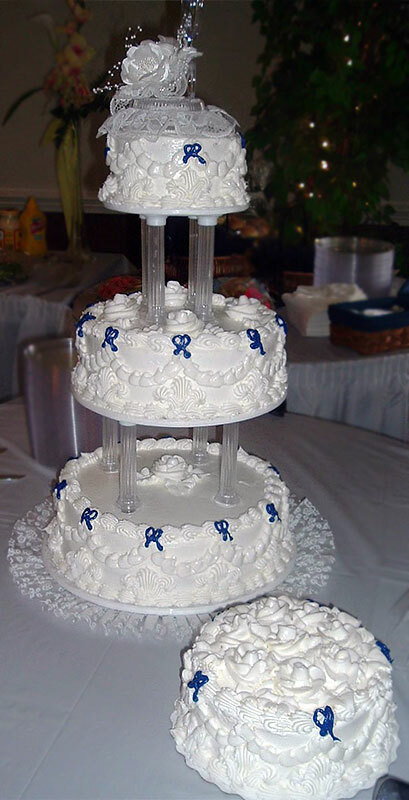 Contact Nino’s for your special cake – be it a wedding cake or celebrating an anniversary. It is best to set up an appointment 4 to 8 weeks before your event. Call or stop into the Bakery to set up an appointment with Theresamarie. (941) 833-8912. Contact Nino’s for your special cake – be it a wedding cake or celebrating an anniversary. Call or stop into the Bakery to set up an appointment with Theresamarie. It is best to set up an appointment 4 to 8 weeks before your event.